Are Kiotrend's shoes structured with a good arch? 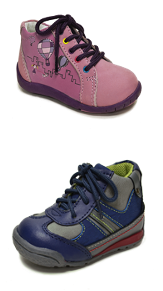 All our shoes, not matter in which genders or styles, there are arch cushions in every pair of shoes, boots and sandals to support the growing feet. One more support we have that none of American brands has is the elongated back counter on the arch side for all baby booties. It supports baby's feet from inside. Our theory is growing feet need good support and protection. Also, all our shoes and sandals are made with leather lining and insole which makes the shoe breathable and comfortable. Why is special care so important for your baby’s feet? The fitting for your baby’s shoes is very important in protecting and supporting their feet. New parents may not know that children’s feet are extremely delicate because they have very soft cartilage instead of bones, nor do they have a visible arch. Their feet only fully harden into adult shape at the age of 18. Poor fitting shoes may damage an infant’s feet by squeezing or deforming the cartilage – and can even affect their posture and walking style permanently. Should my baby wear shoes when learning to crawl? Infants grow very fast before they learn to crawl. Barefoot is still the best choice for natural foot development. However, keeping them barefoot is not always practical and you will need to protect your babies’ feet from bruises and scrapes from furniture or hard objects. That’s where a pair of shoes with ample room for toe movements and flexible sole can help. When to buy your baby’s first pair of shoes? Children have different foot care needs, from newborns to teens. Newborn babies do not have bones in their feet. Even tight socks may damage the cartilage which is surrounded by flesh. Pediatricians suggest that infants learn to crawl or walk barefoot before wearing their first pair of shoes. The only exception would be a pair of soft shoes that are loose around toes. It should simulate barefoot conditions, and bend easily. This will keep your baby’s feet warm and protected. Stay away from sneakers with thick soles because they are not soft enough.